Indian Government files counter-affidavit in India’s Supreme Court praising safety features being implemented by GosAtomNadzor. The Russian-built Kudankulam Nuclear Power Project (KNPP) received a shot in the arms in the legal battle over safety aspects. The Indian Government has placed on record its appreciation for the Russian Nuclear Safety Authority, also known as GosAtomNadzor (GAN) with the Supreme Court. The Nuclear Power Corporation of India Limited (NPCIL), which owns and runs all nuclear power plants in India, including KNPP, filed a 20-page counter affidavit in the Supreme Court on Thursday. The affidavit filed by Ashok Chauhan, NPCIL’s Executive Director (Fuel Cycle Management and Safety Safeguards), has said that GAN had reviewed and cleared the Safety Analysis Report of KNPP units 1 and 2, which forms the basis of licensing safety review. The NPCIL told the court that the Kudankulam Project has a unique passive safety feature which provides cooling to the nuclear fuel without the need for operator action or power supply. This mechanism is known as Passive Heat Removal System. To decode it for the common man, this system consists of a series of air coolers rather than motor car radiators which are installed at a greater height outside the secondary reactor building in an annular arrangement. This feature was not originally there in the original design. The Indian safety authorities insisted on this feature to be incorporated in the design and the Russians obliged. With the help of the Russians, the KNPP has become the first nuclear plant in India to adopt this novel safety feature, according to the NPCIL. The NPCIL has assured India’s apex court that the Kudankulam plant is not vulnerable to terrorist attacks or sabotage. “It has elaborate physical security arrangements in place to ensure its security. The structural design of the facilities at KNPP ensures that in the event of a physical attack, the structure would prevent the release of any radioactivity into the public domain,” it said. KNPP incorporates various systems that are in place to detect acts of sabotage. Besides, in case of nuclear reactors, even in the remote likelihood of the security being breached, the reactor would go on the safe automatic shutdown mode. The NPCIL has given a written assurance to the Supreme Court that the Kudankulam plant is “absolutely safe” and fully equipped to deal even with Fukushima type of accident. This is despite the fact that only seven of the 17 recommendations by the Atomic Energy Regulatory Board (AERB), made by an expert committee set up in the wake of leakage of radioactive materials from a damaged nuclear plant in Fukushima in Japan after a tsunami in March 2011, had been implemented by the government thus far. “Even if a Fukushima type of incident were to occur, the KNPP is fully equipped with all safety measures to withstand any such unlikely event,” the NPCIL has said. This may sound a tad technical but narration of few technical details is necessary to convey the extent of technical help and expertise that the Russians have been giving to the Indians for the Kudankulam project. A nuclear power plant is drastically different from a thermal plant. The technology is much different and superior. The biggest challenge for the scientists is first to insulate the plant from radioactive leaks, accidents, sabotage and terror attacks. The difference between a thermal plant and a nuclear plant is that the nuclear fuel needs cooling even after the chain reaction has stopped because of the decay of the products formed during nuclear chain reaction. 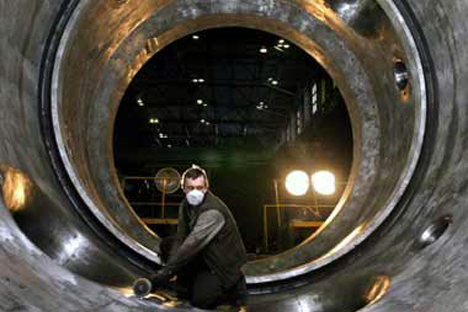 This imposes some specific requirements like decay heat removal in nuclear power plant to take care of the decay heat. Even after the plant is in shutdown condition there are many safety systems incorporated in the KNPP which include control rod containing materials which absorb neutrons to stop the chain reaction (called poisons) and other poisons which are injected in the coolant boric acid. The various safety systems which are involved are primarily associated with three requirements: (i) shutting down of the plant; (ii) removal of decay heat; and (iii) mitigation of any release of radioactivity. The Russians have been pro-actively helping the Indians at every stage. This is the crux of what the NPCIL has submitted before the Supreme Court. The next hearing is scheduled for October 4. The writer is a New Delhi-based journalist-author and a strategic analyst.